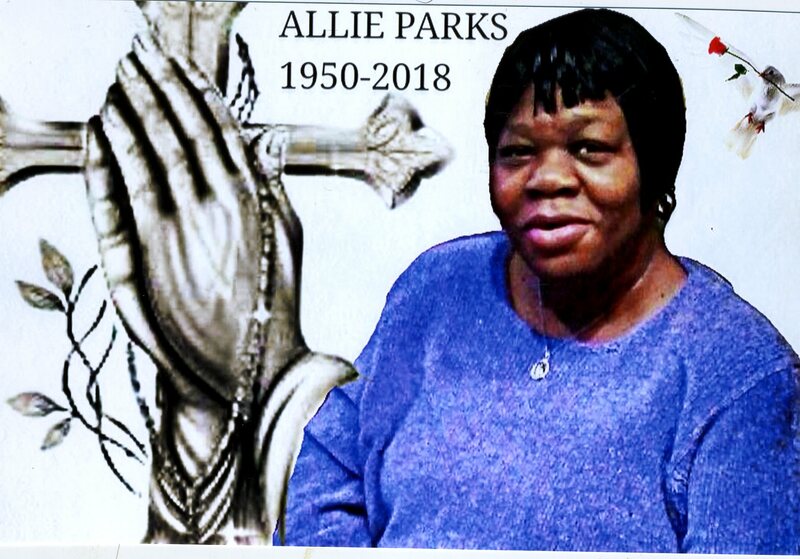 Allie Parks was the loving mother of five children. She always thought of her children and put them first. Her lifelong desire was to have a family reunion and see all of her children in one place together loving one another. Allie will be sadly missed. Don’t cry because she is gone. She is in that home beyond the sky. Never to cry or mourn again because she has found that peace from within. Allie will be missed by family and friends especially by her children. Whenever they had a need, she was there to help. She was the one that believed and encouraged her children regardless. The confidence placed in us was the driven force to succeed. Visitation 11:00am Funeral 12:00pm Wednesday, January 31, 2018 at MARLAN J. GARY FUNERAL HOME, THE CHAPEL OF PEACE NORTH, 2500 Cleveland Ave.
Interment at Evergreen Burial Park. To the Parks Family, I am so sorry for the loss of your love one. You all are in My Thoughts and Prayers. Cousins, I am deeply saddened by the loss of aunt Allie. She will be truly missed, you have my deepest condolences. To The Parks Family: I am so saddened to hear of the death of my friend, classmate and Williamson neighbor, Allie. Allie was so kind and thoughtful and a joy to be around. I pray that you gain strength and comfort remembering all of the good times with her. Allie was one of my closest childhood friends and she will be deeply missed. My thoughts and prayers are with the entire Parks family as you pass through this season of loss and grief. Allie was one of my closest childhood friends. She will be deeply missed. My thoughts and prayers are with the entire Parks family as you pass through this season of loss and grief. Saddened by the loss of my friend and classmate. Praying for the family. Prayers for your family during this time. So sorry for the lost ! She will be missed rip ! Just learning of Allie’s passing. We were classmates at Liberty. I remember her fondly. God bless her family.